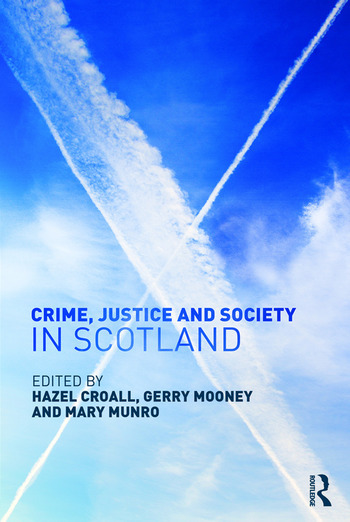 Crime, Justice and Society in Scotland is an edited collection of chapters from leading experts that builds and expands upon the success of the 2010 publication Criminal Justice in Scotland to offer a comprehensive and critical overview of Scottish criminal justice and its relation to wider social inequalities and social justice. This new volume considers criminal justice in the context of the Scottish politics and the recent referendum on independence and it includes a discussion of the complex relationships between criminal justice and devolution, nationalism and nation building. There are new chapters on research and policy, sectarianism, gangs, victims and justice, organised crime and crimes of the powerful in Scotland, as well as chapters reflecting on the use of electronic monitoring, desistance and practice, and major changes in the structure of Scottish policing. Comprehensive and topical, this book is essential reading for academics and students in the fields of criminal justice, criminology, law, social science and social policy. It will also be of interest to practitioners, researchers, policymakers, civil servants and politicians. Part 1: Thinking about and researching crime and criminal justice in Scotland: introduction and social context 1. Introduction, Hazel Croall, Gerry Mooney and Mary Munro 2. Scotland’s political and policy landscape: devolution, social and criminal justice, Gill Scott and Gerry Mooney 3. Research, knowledge and criminal justice policy: the Scottish experience, Katrina Morrison and Richard Sparks 4. Crime and Inequalities in Scotland, Hazel Croall and Gerry Mooney Part 2: Issues in Crime and Justice 5. Youth Gangs in Scotland, Ross Deuchar 6. Interpersonal violence in Scotland: an agenda for prevention, Damien J. Williams and John Carnochan 7. Sectarianism, Criminalisation and the civilising process in Scotland, Alex Law 8. Organised Crime in Scotland and the Criminal Justice Response, Ben Cavanagh, Niall Hamilton-Smith and Simon Mackenzie 9. Crimes of the Powerful in Scotland, Hazel Croall Part 3: Aspects of Criminal Justice process and practice 10. Victims’ policy in Scotland, Mary Munro 11. Policing Scotland post reform: towards a shifting ‘culture of control’ and a new politics of policing?, Nicholas R. Fyfe 12. The Strategic Failure of Electronic Monitoring (EM) in Scotland, Mike Nellis 13. Desistance and Criminal Justice in Scotland, Fergus McNeill Part 4: Looking ahead 14. Crime, justice and society in Scotland: reflections and future prospects, Mary Munro, Gerry Mooney and Hazel Croall. Hazel Croall is Emeritus Professor in Criminology at Glasgow Caledonian University, where she set up and ran a criminology degree. She is the author of several books and articles on the subject of white collar and corporate crime, and was a member of the Scottish Executive Expert Group on corporate manslaughter in 2005. She is the author of Crime and Society in Britain, (2nd edition 2011), co-author of Criminal Justice in England and Wales, and has published both single and joint authored articles and chapters on aspects of Scottish criminal justice as well as being co-editor of Criminal Justice in Scotland (2010) with Gerry Mooney and Mary Munro. She is currently consulting editor of the e-journal Scottish Justice Matters. Mary Munro is a former solicitor and probation officer. She is currently Senior Visiting Fellow at the Centre for Law, Crime and Justice, Law School. University of Strathclyde, with a special interest in restorative justice. With Gerry Mooney and Hazel Croall, she co-edited Criminal Justice in Scotland (2010). She is also managing editor of Scottish Justice Matters.